Natural Resources Map & Bookstore. PRESS RELEASE: Utah 2017 Mining Production Value up Seven Percent, Totaled $3.3 Billion. Salt Lake City (Dec. 4, 2018) – The value of Utah’s mineral production in 2017 totaled about $3.3 billion and is up about 7 percent from 2016. This finding is presented in a new report by the Utah Geological Survey (UGS). The publication, Utah Mining 2017, contains detailed information on the value and production of Utah’s mined commodities including metals, industrial minerals, and coal. The value of both base and precious metals production increased significantly in 2017, 11 percent and 15 percent, respectively. Base metal production contributed $1.4 billion to the total value and includes copper, magnesium, beryllium, and molybdenum; copper accounts for 70 percent of total base metal production value. Nationally, the U.S. Geological Survey ranked Utah 8th in production of metals and industrial minerals in 2017―Utah has ranked among the top ten for the past decade. Precious metals produced in Utah include gold and silver and were valued at $261 million in 2017. Utah also produced industrial mineral commodities including sand and gravel, crushed stone, salt, potash, cement, lime, phosphate, gilsonite, clays, gypsum, and others. The estimated value of industrial mineral production in 2017 reached $1.2 billion, a 5 percent increase over 2016. The most valuable industrial mineral group in 2017, estimated at $410 million, was the brine- and evaporite-derived commodities that included potash, salt, and magnesium chloride. In contrast to other minable commodities, the value of Utah coal production decreased in 2017 to $493 million, from $509 million in 2016. Notably, Utah remains the only state to produce magnesium metal, beryllium concentrate, potassium sulfate, and gilsonite. Of these mineral commodities, magnesium, beryllium, and potash (includes potassium sulfate) are included on the U.S. Department of the Interior’s 2018 critical mineral list. Nationally, the U.S. Geological Survey ranked Utah 8th in production of metals and industrial minerals in 2017―Utah has ranked among the top ten for the past decade. The U.S. Energy Information Administration ranked Utah as the 11th largest coal producer out of 24 coal-producing states and accounted for 1.9 percent of total U.S. coal production. The summary report has been substantially revised since its previous release and includes helpful new figures showing historical production of a variety of mineral commodities and highlights various economic data, such as the mineral industry’s tax contributions. Utah Mining 2017 also provides information on historically produced commodities such as uranium, and current mineral exploration and development within the state including information about vanadium and lithium. 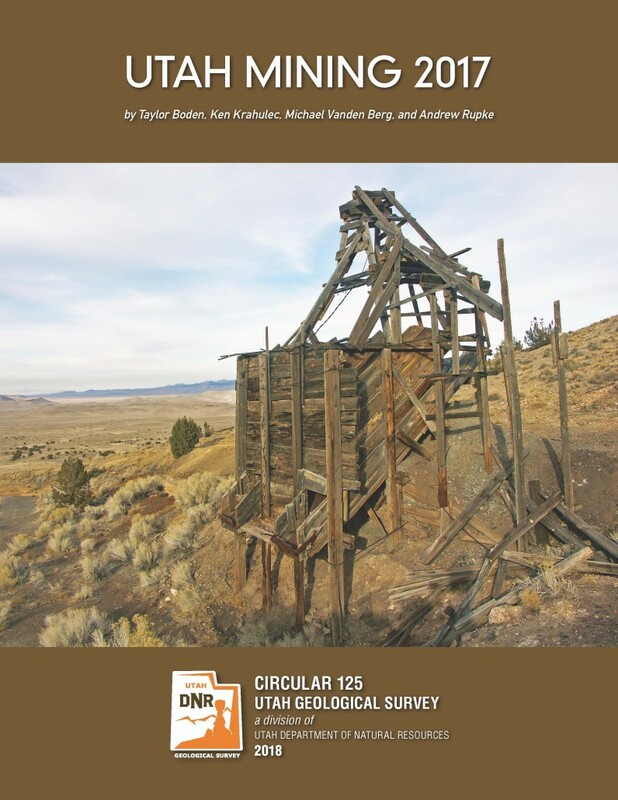 The 30-page report, Utah Mining 2017 (UGS Circular 125), is available as a free download. The report can also be purchased at the Natural Resources Map & Bookstore, located at 1594 West North Temple, Salt Lake City, (801) 537-3320 or 1-888-UTAHMAP, http://mapstore.utah.gov. The Utah Geological Survey provides timely scientific information about Utah’s geological environment, resources, and hazards.